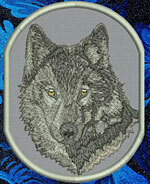 We created the Extra Large Grey Wolf HD Portrait #2 Embroidery Patch for the back placements on ladies jackets and other garments. Also good fit for larger tote bags and other accessories. This product was added to our catalog on Sunday 15 December, 2013.